Come learn how to build and mod a PC like the pros. Have you always wanted to build a PC from scratch but find yourself hesitant to take that first step? It's easier than you think, though it can also be an intimidating prospect handling all that expensive hardware when flying solo on a build. What about learning to overclock or modding your case? Both can prove difficult even for experienced users. Well, good news—the folks at Intel and Asus are sponsoring several Maximum PC Workshops at PC Gamer Weekender that will cover these topics and more. The workshops run the gamut from learning the basics about your PC to troubleshooting issues, and everything in between. No matter what your level of experience, you're bound to learn something new. Jarred and Zak will be on hand to talk graphics cards, motherboards, processors, benchmarks, and more. Discover what makes a PC tick, from the PC Gamer and Maximum PC team. Find out what components you should be looking for to build your ultimate rig, and feel free to ask questions about any of the hardware as and when you like. Sit down and discover how to build a machine from start to finish. Have our team help guide you through the process without the fear of breaking any of your gear. Ask questions and find out the best tips and tricks to make your pc-building experience as easy and seamless as possible. Let our crack team of modders show you how exactly you can spruce up your system. Explore the different hardware involved, from LEDs and braided cables to full on mods and custom cases from the community. Discover how to push your machine to the absolute limit. Hear from world-record-breaking overclockers as they give you the know-how you need to breach those silicon barriers, and how to get more frames for your buck. Is size really all that matters? We will also tell you if 144Hz is really all that it's made out to be. Drop in and see our experts to ask any questions you might have about your rig setup. 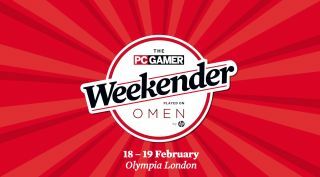 The Maximum PC Workshops will be joined by many more speakers, games and booths, all at the PC Gamer Weekender, which is being held February 18-19 at the Olympia, London, in the UK. For more details see the site, and follow us on Twitter for up-to-the-minute news. Tickets are available now from £12.99.